Why your brand needs a Vector logo? Managing your brand’s logo assets can be confusing because of the variety of file formats. Knowing whether a .jpg, a .pdf or an .ai is the best option for your project may be a gamble unless you know the differences. 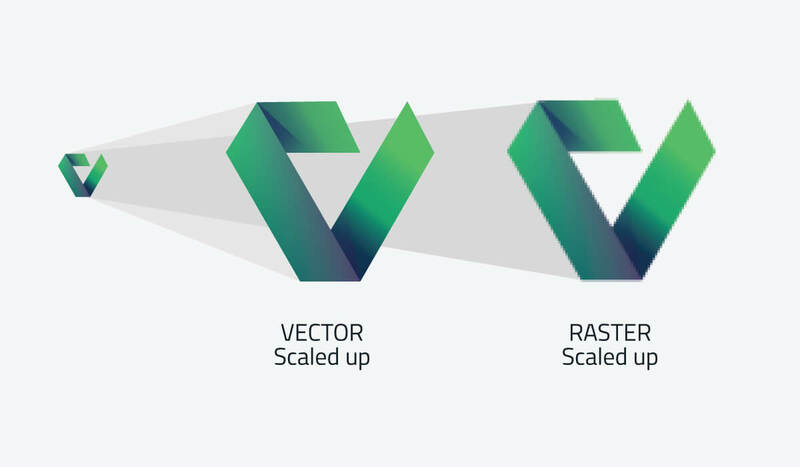 There are differences between vector (.ai, .eps, .pdf) and raster (.jpg, .png, .gif) files that will have an impact on how well your brand reproduces. Raster vs. Vector images – what’s the difference? Raster art is defined by Wikipedia® as In computer graphics, a raster graphics image, or bitmap, is a dot matrix data structure representing a generally rectangular grid of pixels, or points of color, viewable via a monitor, paper, or other display medium. In short raster artwork itself is resolution dependent. Meaning they cannot scale up to an arbitrary resolution without loss of apparent quality. Vector art itself is defined by Wikipedia® as is the use of geometrical primitives such as points, lines, curves, and shapes or polygon(s), which are all based on mathematical expressions, to represent images in computer graphics. In short Vector art is scalable. Meaning that a vector logo can be resized for various uses without distorting it’s integrity or losing quality. This is very important when maintaining a consistent brand identity in various applications. Notice the quality of the Vector format is maintained as it’s magnified, whereas the Raster format looks really awful? Why would you want to work with a designer who does not create logos in vector format? Answer is you don’t. If the designer is limited to what he can do with the design of your image, then so are you. Partnering with a graphic design studio that can care for all of your logo assets is a wise investment to make in your brand. Do you have a vector logo? Often companies happen to have some system wreck where flies get lost or simply they lose their source file to their logo. If you don’t have a vector logo file, Calypso Design can help! Our in-house designers can recreate your logo as a vector graphic for future use. 2018. CalYpso Design. All Rights Reserved.